The time, it would seem, is drawing near for Vatican watchers to study the sky for a plume of white smoke. Here’s a timely reference for those handicapping the race for the next pope—and contemplating the future of Catholicism. Pham (James Madison Univ. ), a former Vatican diplomat, knows the ground of his inquiry well. 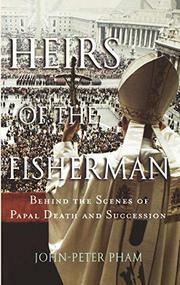 He thoughtfully considers the history of papal succession, never an easy matter to begin with and at times the cause of schism within the church; he looks into the various ways popes have come to their earthly ends (martyrdom, misadventure, assassination, old age); and he even offers a few morsels for the conspiratorially inclined (the surprising number of high-ranking deaths surrounding the passing of Pius XII; a little-publicized al Qaeda attempt on John Paul II’s life a decade ago). Dense with tables, biographical sketches, and other scholarly apparatus taking up half the book, Pham’s study may well be the last word—for now—on the arcane and controversial ways popes have been selected in the past: “. . . political considerations do play a part, albeit not necessarily the predominant part,” he asserts, adding that the larger the electoral body of cardinals, the greater the chance for swings and surprises. Of broader interest, however, is his reckoning of the challenges the next pope will face, especially since talk of such conditional matters is very nearly taboo in Vatican circles. For one thing, he remarks, the church of the near future will draw most of its membership from the Third World, due to declining religiosity among European and North American Catholics; for another, the next pope will have to deal with the potential for growing conflict between Christianity and Islam; and questions of theological pluralism, divorce and remarriage, priestly celibacy, contraception, and the role of women in the church will grow ever more pressing. Students of the papacy will find this an invaluable reference, as will trendwatchers and other scholars of the future.